Favorite post – EVER!! Thrilled to see that others wear family treasurers! What a great find! You’re right…..the quality of that sweater is hard to find nowadays unless maybe you shell out pretty big bucks. I LOVE the leather-covered buttons! 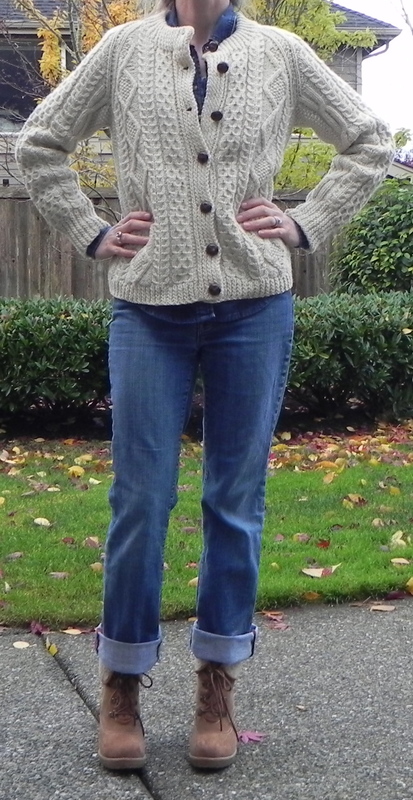 I like the oversized sweater…..but perhaps paired with skinny jeans and tall boots…that might be a bit more flattering. Either way, you look wonderful in your current outfit! I love those boots you have on….every time I see them in one of your pics, I’m always like, “Dang, I gotta get me a pair of those!” They add so much to every outfit you pair them with! Hope Hawaii was wonderful …it’s on my list of places I want to see someday….! Welcome home! I love your sweater. My parents had sweaters just like that when I was a kid. I’ll have to check with my dad to see if he still has his, even though on me it would fall into the category of wearing clothes that are too big… 🙂 Still, it would be a great find! Love your look.